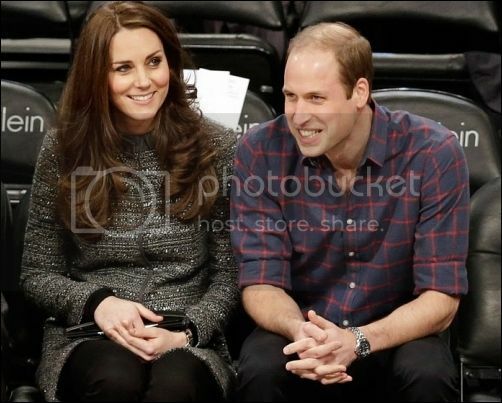 Dec. 8 -- The Duke and Duchess of Cambridge are making a much publicized visit to New York City this week, and were able to take in an NBA game in the process. Amidst a meeting with Prince William and President Obama in Washington, Duchess Kate's visitation to a child development center in Harlem and the royal couple's meeting with former first lady Hillary Clinton and former first daughter Chelsea Clinton, the couple also had a private dinner with NBA commissioner Adam Silver and others. Then it was off to their courtside seats to watch the Cleveland Cavaliers take on the Brooklyn Nets at the Barclay Center. During the break between the third and fourth quarters, they were greeted by Brooklyn's "royalty," musical artists, Jay-Z and Beyonce. Jay-Z is part owner of the Nets. It was the first NBA game attended by the Duke and the Duchess. Had the couple arrived a day earlier, they could have had the opportunity to see fellow countryman Joel Freeland and his Portland Trail Blazers play against the Knicks at Madison Square Garden on Dec. 7. "Kate’s day began among local youngsters, in a visit to a Harlem children’s center, where the duchess showed she had the common touch — and displayed some uncommon gift-wrapping skills. 'She got down on her knees and worked with the kids,' said Dr. Thelma Dye, who heads the Northside Center for Child Development. 'She had glue all over her fingers.'" Meanwhile, William met with President Obama for the first time at the White House. The couple later made it to the Barclays center where they watched the Cavaliers defeat the Nets, 110-88, in courtside seats. Sitting next to them was former NBA center Dikimbe Mutombo. 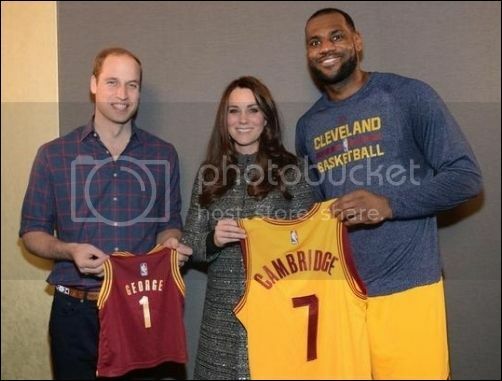 They also has a chance to meet several players, including LeBron James, who gave them each Cavaliers shirts with "Cambridge" printed on the back and a child's with "George" on it to be intended for the couple's son, George. The couple is expecting their second child in April. The Duke and Duchess are in New York for three days. It is their first official visit to the United States since their 2011 visit to California. To comment on this or other threads on this forum, please login or register.